Late fall through winter, using 2–3 year old plants. Blueberries require acidic soil; a soil test will help determine how much to acidify your soil. Be sure the soil has a pH between 4.5 and 6.5. If it's a clay soil, use organic mater to amend the soil, preferably peat moss. 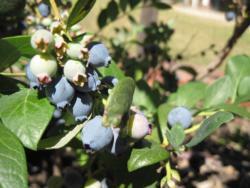 Oregon State University has information on acidifying soil for blueberries. Blueberries do well in containers like half wine casks. Be sure there is a drainage hole. Harvest window: May–September, depending on variety. Most ripen in June. Protect from birds with netting. Fertilization: Balanced acid loving plant fertilizer in late winter, early spring, additional applications as needed. Be sure the label includes blueberries. More information on fertilizing blueberries available from the Purdue University Cooperative Extension. Blueberry varieties appropriate to Santa Clara County [Southern highbush and Northern highbush] bloom in late January through March. These flowers become berries for harvest in late May through early September. New branch and leaf growth begins after berry harvest and continues until fall colors appear in September through November. Some, not all, blueberry varieties are deciduous and drop their leaves in late November–December. The plants are dormant December–January. Blueberries need annual pruning to maintain the right balance of new & previous season growth. Adding sulfur during our wet season helps maintain acid soil conditions. Mulch in hot summer / early fall weather so roots remain cool and moist. Fall Creek Farm & Nursery offers comprehensive information about growing blueberries and new varieties for the home gardener. Dave Wilson Nursery offers Growing Blueberries for Home Gardens. Blueberries: Bluecrop, Chandler, Georgia Gem, Gulf Coast, Jubilee, Miramba, Misty, O'Neal, and Reveille. More details are available on our blueberry varieties page. No endorsement of named products or companies is intended, nor is criticism implied of similar products or companies that are not mentioned, nor is currently availability guaranteed.